Living in the Midwest, it’s not too often that we can skip away to the ocean. But Midwesterners have their own slice of paradise – Lake Michigan. The ocean-like Great Lake has plenty to offer and one of our family goals is to hit up all the beach towns located on the Lake. 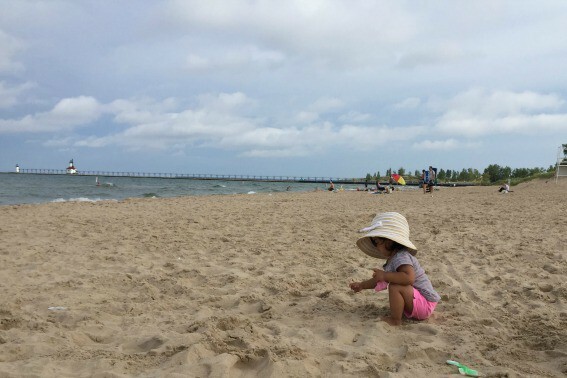 One of the towns that locals rave about is St. Joseph, Michigan. Located just 90 minutes east of Chicago,“St. Joe’s” is an ideal family vacation for those who need a quick getaway and are craving a beach vacation. Time to hit the beach! It is, after all, the main reason you came to St. Joseph, right? We were wowed by the super soft sand at Silver Beach County Park. The kids will love the water and making sandcastles, of course, but the icing on top will be the fun playground located a few steps away. Love lighthouses? Then you’ll want to walk the pier to the newly restored lighthouse. The St. Joseph North Pier Inner and Outer Lighthouse will not disappoint and are both located on the same pier. Take a spin around The Silver Beach Carousel, a unique hand-carved carousel. 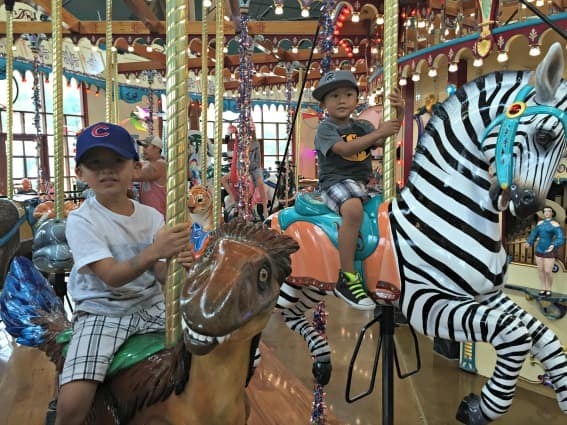 The entire carousel is housed indoors so it can be ridden rain or shine. You’ll find animals you’ve never seen before such as a clown fish, a sea otter and even a velociraptor. Across the street lies the Whirlpool Compass Fountain, a huge 150-foot splash pad/fountain with eight water cannons and 28 water jets that make it a worthwhile diversion. 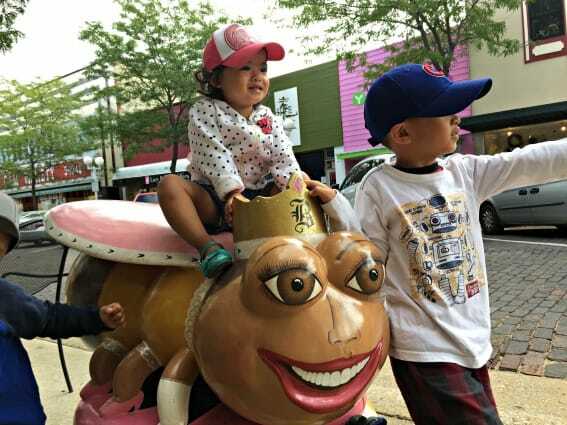 Let kids be kids at the Curious Kids’ Museum and the Curious Kids’ Discovery Zone. The museum offers more than 100 hands-on exhibits for kids 1-10, while the Discovery Zone offers educational fun for kids up to age 12. Take a stroll down the charming brick-lined streets of downtown, and browse the unique boutique clothing and antique shops. The statues that line the street are also photo-worthy. Kids won’t want to miss out the very cool toy store, The Toy Company. Try The Mason Jar Café in The Arts District of Benton Harbor for a big breakfast. You’ll need all the energy you can for all the exploring you’ll do! 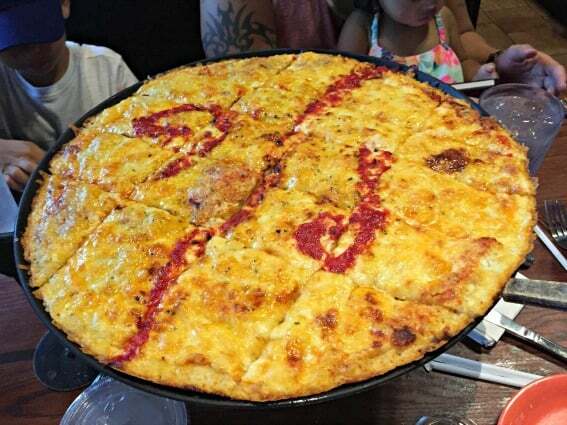 After a fun day at the beach, head across the street to Silver Beach Pizza . The popular pizza joint is well loved for good reason– the pizza rocks! We fell in love with the four cheese pizza and the pepperoni pizza with a garlic spin. We really appreciated that they gave kids mini pizza dough to play with – it was the perfect diversion. Tip: Take the pizza to go and have a picnic on the beach. Another option for food is The Grille at Harbor Shores (rated one of the best new restaurants in the area) or nosh on farm-to-table food at Plank’s Tavern on the Water, found at The Inn at Harbor Shores. Craving dessert? You won’t want to pass up froyo at Yo-Bubbs or delicious ice cream at Kilwin’s. Want to stay close to all the action? 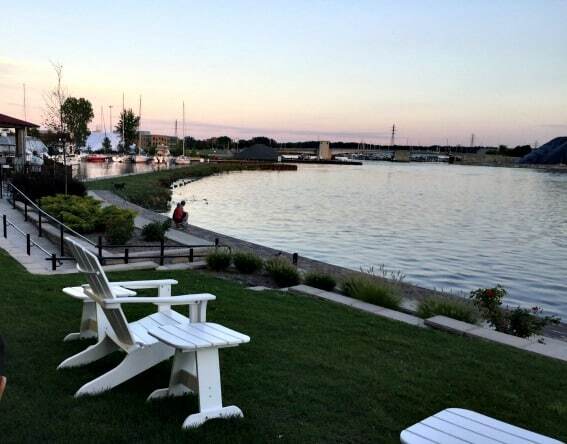 The Inn at Harbor Shores is an ideal location just five minutes away. Not only does the Whirlpool-factory-turned-hotel boast harbor front access, an indoor and outdoor pool, access to a golf course and comfy rooms with balconies, but we loved how it paid tribute to all things Michigan by showcasing local artwork and using Michigan-made materials in its building. Plus, the sunset views were gorgeous! Disclosure: The author was hosted for a complimentary stay in St. Joseph. She was not required to state any particular view; all opinions remain her own.